Welp, I sold my car. And now I’m rich. As rich as one can get when selling a 2003 teal Hyundai Santa Fe. I went to the mall after work and DID. NOT. BUY. A. THING. yikes. Making this short and NOT sweet (let’s face it, I’m not a ‘sweet’ person) I wanted to share the quick upper body workout I did tonight followed by hills and HIIT on the bike. Just a pyramid workout, where 1 rep is done of each move, then 2, then 3, up to 10, then all the way back down to one. I used 12 pound weights where applicable. And yeah, I played around with picmonkey for this graphic because I’m feeling adventurous. And watching Homeland. Not that watching Homeland is a reason to make a cheezy graphic. Don’t pin that. It’s embarrassing. Also, I just took an INSANE batch of muffins out of the oven. Will share tomorrow. Drooling just thinking about it now. MUST STOP THINKING ABOUT THEM NOW. Ha! We drive the same car (well you used to since you just sold yours :P)! Just watched this season’s first episode of Homeland. Love that show! Love the pyramid workout, can’t wait to try that out. I felt the same way when I sold my Jeep in May! I was rich for a moment and then paid off a chunk of my student loans. Womp womp. 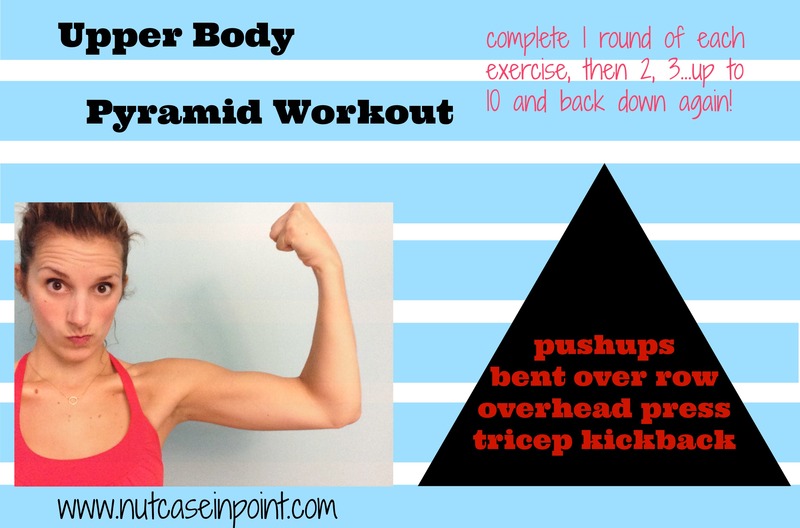 Love this upper body workout – will definitely add to my Pinterest board! Hey! My name is Jen and I am an American living in Calgary, AB with my husband, baby boy and doggies. I love to workout, eat, drink beer (or wine, I don't discriminate) and bake! Thanks for visiting!